The Forms & Reports section provides faculty members with access to custom input forms and various reports, along with their initiated activity input forms. To access the Forms & Reports section, click the Faculty menu, then click Forms & Reports. The Forms section provides faculty members with access to custom input forms that have been created by their institution, along with their initiated activity input forms. 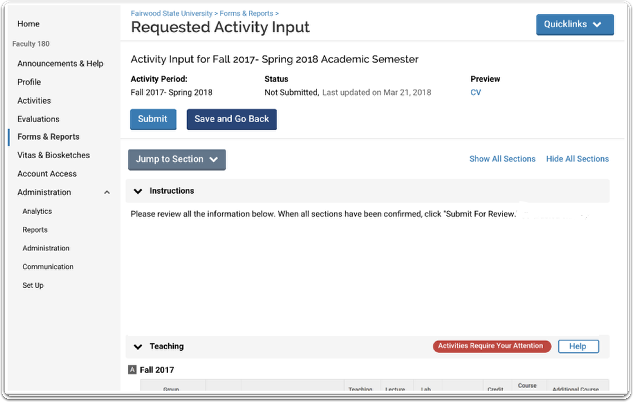 The Activity Input form is used by a faculty member to input their activities (courses taught, research, service, professional development) that occur or change each academic term. Faculty members can update their activities at any time but are required to submit an update of their activities whenever administrators initiate the faculty input process (typically each academic term or each academic year). See Activity Input Form for more information. The Reports section (toward the bottom of the page) is used to generate various types of reports for information purposes, such as activity reports and prior activity input forms. 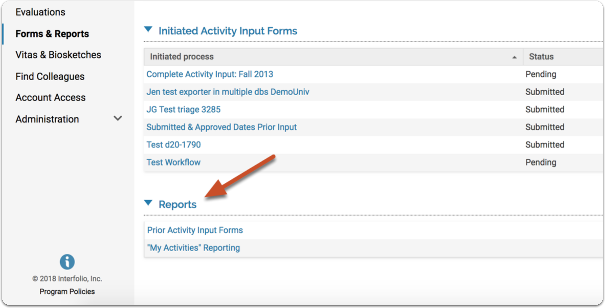 In the Reports section, click Prior Activity Input Forms. A list of activity input forms that have been previously submitted displays. To view an activity input form, click the corresponding View icon. The selected activity input form displays. You can also print and download the activity input form as a PDF if desired. 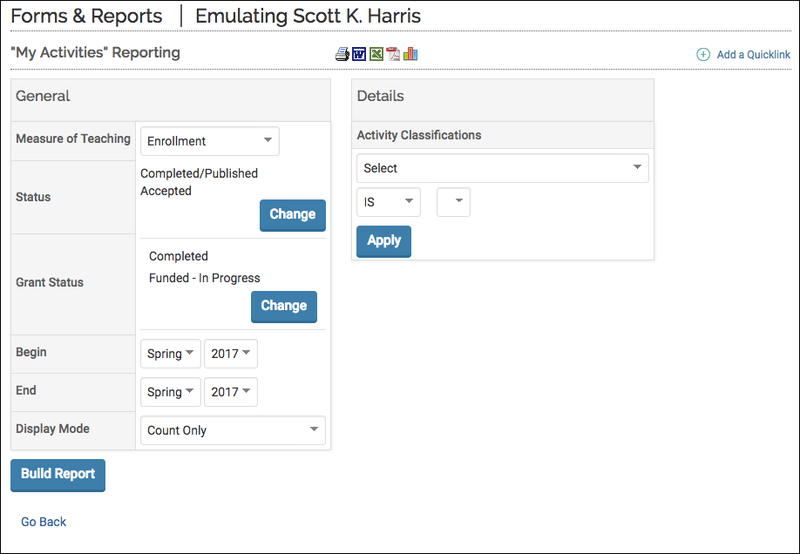 "My Activities" Reporting displays all activities that have been entered into FACULTY180, based upon various filters, including the measure of teaching, a status of the activity, grant status, date ranges, and activity classifications. In the Reports section, click "My Activities" Reporting. Use the various filters to display the desired information. By clicking on the 'Total' or summary value, you can dive deeper into it. For example, if you dive into your scholarly contributions by clicking on the number value, then you can export a CSV of all of the scholarly work. 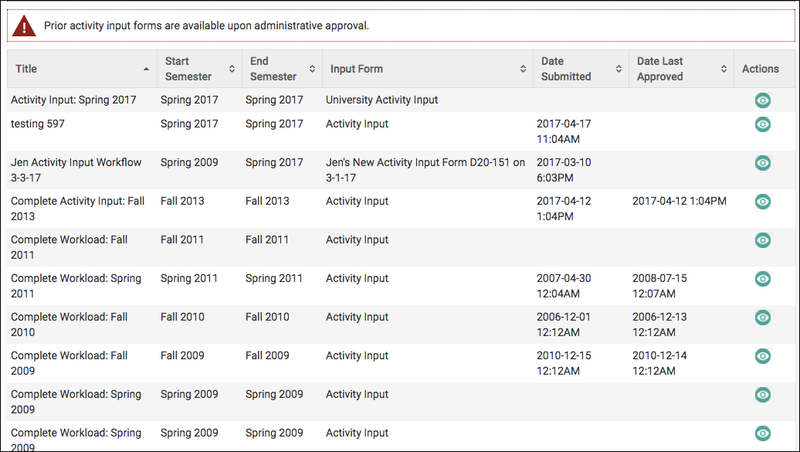 The Initiated Activity Input Forms section lists the activity input forms that have been initiated as part of your institution's formal input workflow process. This process allows faculty members to input and manage their information and activities in the Activity Input Form. After all the sections have been completed, submit your Activity Input Form by clicking Submit For Review.